"These bars are easy to make and they are delicious! 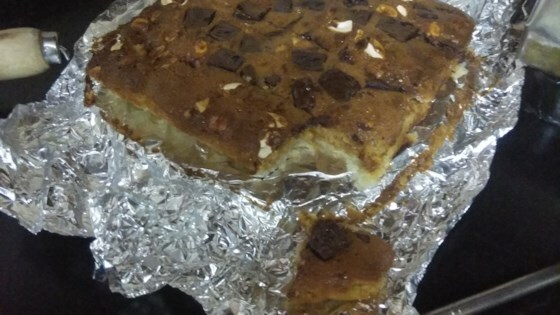 I baked them for my staff at the office and they were gone in a matter of minutes." Whisk flour and sugar together in a bowl. Cut butter into flour mixture using a pastry blender until crumbly; press into a 9x13-inch baking dish. Bake in the preheated oven until crust is lightly browned, about 15 minutes. Mix sweetened condensed milk, egg, and almond extract together in a large bowl. Fold chocolate, toffee-flavored baking bits, and almonds into sweetened condensed milk mixture; spread over the warm crust. Bake until cookie bars are golden brown, about 25 minutes. Cool completely before cutting into bars. Store in a covered container in the refrigerator. While they are still warm out of the oven, be sure and take a knife around the edge of the pan to keep them from sticking. These were absolutely wonderful! Loaded with taste and so easy to make. They are very rich, so I cut them smaller. I will be making these again , thanks Mama Mona for a great recipe! I subbed butterscotch chips for caramel bits - but otherwise followed the recipe. It's an amazing, easy, sinfully good fix for sweet cravings!! Excellent! I used 1 cup flour and 1/2 cup almond flour. 1/2 bag each dark chocolate chips, and toffee bits. 1/2 cup flaky coconut. My family can't get enough of this one!! I don't change a thing. It is rich, so I cut them small. This is so yummy! I have made it several times since I found it! I like it best without the almonds and with toasted coconut! Highly recommended.